There are several varieties of 'payasams'. Payasam is a traditional South Indian delicacy made on all festive occasions.We prepare Payasam as ‘Prasadam’(offering to God). This mouthwatering sweet dish is prepared of coconut milk , jaggery and broken wheat. Grate the coconut. Add 1/2 glass warm water to the grated coconut. Extract the first coconut milk by filtering the mixture of coconut and water. Extract the second milk by adding 1 1/2 glass warm water. Repeat the process to extract the third milk. Saute broken wheat lightly in one teaspoon ghee. Cook the brown wheat in 1 1/2 liters of water. Add the third milk and the second milk to the wheat and bring to a boil. Let the mixture thicken to a semi solid consistency then add powdered jaggery. Finally add the first milk and simmer it for a while. Season it with fried nut, raisins, powdered cardamom, ginger and cumin. Stir well and remove from fire immediately. This is my contribution for Festive Food Event -Onam Celebration hosted by Priyanka. wow! that's delicious! mouth watering pic sireesha! want to try it soon! 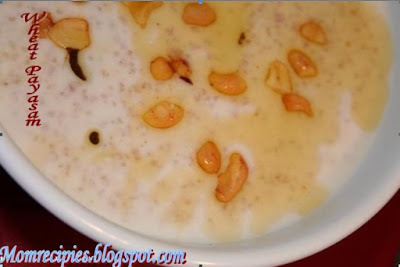 i am a new blogger.payasam is delicious.hv added u to my blog. wow... looks yummy & delicious... nice entry & great click.. thxs for sharing..
Wow looks yummy....gud one dear...and thanks for entry.. Yes dear,was very busy with work...now the load is less.Hope u r doing great. 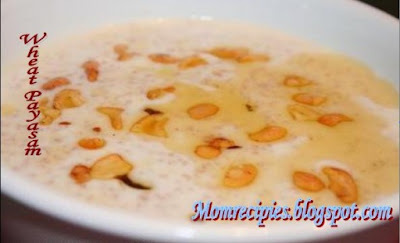 I love payasam...this one looks great! We call it payesh in Bengali. This is my Dad's all time favourite sweet. Looks yummmmmmmmmmy. gorgeous pic and delicious recipe girl. By broken wheat do you mean the brown rava like cream of wheat? Yes divya brown rava like cream of wheat. Mom used to make this payasom too. Yummy looking payasam! This recipe is new to me!Thanx for sharing! I've not tasted his before but it looks & sounds delicious. looks so delicious Sireesha! yum. Looks like healthy payasam sireesha...Long time back I visited ur blog...Like the kitchen tips too!! !